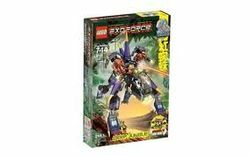 8115 Dark Panther is an Exo-Force-themed set released in December 2007. It includes 222 pieces and three minifigures, namely a Devastator and two Iron Drones. The Dark Panther was designed by LEGO employee Mark Stafford, who also designed several Agents sets. This is a description taken from LEGO.com. Please do not modify it. Leaping from the shadows, this four-legged robot Battle Machine strikes without warning! Drones detach and attack with jetpacks, cannon elevates, and weapon converts to mini-robot scout. Facts about "8115 Dark Panther"